Hey again, friends. Don't worry, the Journey is still beginning eventually, but I decided to do a nice little informative write up/writing exercise about a new indie game bundle making the rounds. For those who avoid the internet out of principle (why are you here?) there's a new trend in the indie games world: bundles. So many bundles. Many of them are for charity. Some of them are to keep indie developers off the streets. But all of them involve sweet games for a ridiculously low price. We can dissect the long term effects of this on the indie development scene another time; right now there are games to be played! While Humble Inc is currently the top dog of the indie bundle world, they've been recently challenged by Desura and Indie Games.com with their fast and furious Indie Royale releases. But beyond those two top dogs, lots of other start ups are looking for a slice of that Humble pie. 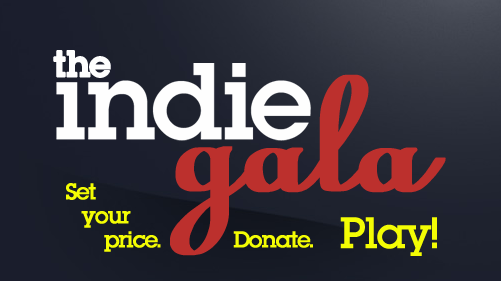 One new scrappy challenger from Italy has recently appeared: IndieGala. Despite a lot of launch issues, IndieGala really steps it up with a very solid line up, including some relatively recent releases. Unfortunately the Gala only sells Steam keys, with no direct download or Mac/Linux support. But in terms of beat the average bonuses and extras the Gala folks definitely hold their own. Hit up past the break for some individual impressions of the games. inMomentum is an interesting experiment. 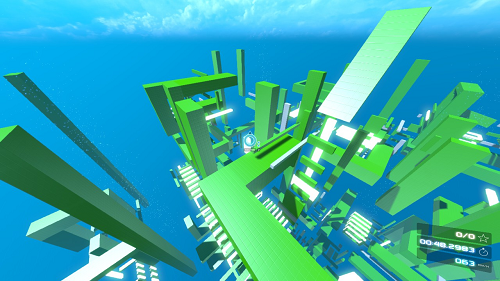 Basically it functions as a very stripped down take on Mirror's Edge, but crazier. Way crazier. You're a cancer patient (really, stick with me) that has the ability to jump off of any vertical surface, but you can only do so two times before you either need to land or find a vertical surface facing a different direction, thumbing your nose at physics all the while. In addition, you have the ability to slow down time, which has never been more crucial in a game ever. There are switches to be shot, power ups to grab and spheres to activate all the while. It's very hectic. It's also very very very hard. I played every single level, and I completed exactly one to the finish. The levels are very openly designed; this gives you a lot of freedom in some places, but can also lead to a seemingly impossible gap that can be incredibly frustrating to figure out how to cross. If this was a slower paced puzzle game I wouldn't mind, but it does tend to interrupt the flow which brings a halt to the very momentum the game is entirely based around. But when the fast pace of inMomentum works, it really works. My favourite part is the Freestyle level (pictured above); no goal or spheres, just mucking about on a bunch of flying boxes as fast as possible. Much as I'd rather not nitpick, I have a few minor complaints. There is almost no story; the pleasant tutorial lady voice informs us that our recovery is going to be slow, but never expands on this because she is too busy winking at the player ("You need to reach the end of the "level" as fast as possible. Just like in a video game! WINK."). Of course, this doesn't really affect the game, but the poor single player offerings and so so menu system do. There's only two modes for the lonely ones out there: Sphere Hunt and Time Trial. I'd explain each one, but I couldn't figure any discernible difference betwixt the two; both have spheres, and both are counting your time. The powerups that seemed so interesting in the tutorial don't make an appearance in single player, at least as far as I played. There are leaderboards, which is nice, and there is multiplayer. Unfortunately I couldn't find a single multiplayer game, which was either a problem on my end or a indication that inMomentum is not going to gain a hefty playerbase; feel free to decide whatever is more likely. All in all, an interesting diversion. It's very hard, and very prone to provoke ragequits. But the idea is solid, and there's a few bits of fun to be had with the wacky physics and controls. Hacker: Evolution Duality is the latest in the Hacker: Evolution series, which is about hacking yet surprisingly not about Darwinism. You hack stuff, take money, buy new gear and hack more stuff to complete your objectives. You can draw a lot of comparisons between this and the recent Humble featured Uplink; fair enough, both games subscribe to the Hollywood definition of hacking (wizards on computers) and both take a very hands off approach to the leet haxorz. The differences are many though; Uplink focuses on a single persistent open world campaign in addition to a lot of management of your resources and upgrades. Hacker Evolution is all about self contained missions, with little crossover between jobs. You get a scenario and have to figure it out before the timer runs out and before the other hackers hack you to pieces with their cyber axes, like the cyberbarbarians they are. 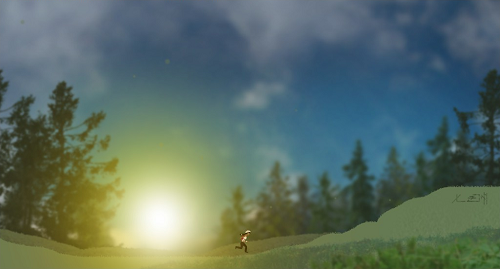 Therefore, the game takes on a mission based puzzle genre structure. 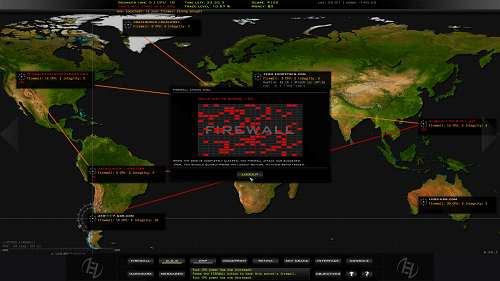 Of course, there is also an open world mode that brings the game closer to the hacktacular sandbox presented in Uplink. The presentation is excellent. Well designed and cool looking graphics, and varied minigames to complete when trying to decode the different kinds of security. The soundtrack is also properly thumpin' enough with beeps and boops all over the place. The verdict on this one? Pleasant surprise. I look forward to diving back into my hacking career. It might not be directly recognizable at first glance, but Saira is from the same developer as NightSky (recently featured in one of the Indie Royales) and it really shows. What I didn't expect was for Saira to be better. Saira is a little more in control than the anthropomorphic ball of NightSky due to the whole having legs thing, and the mechanics are a little more integrated into the game (no screen by screen wacky physics changes here). Saira is, technically speaking, a Metroidvania platformer game, albeit one without items and abilities that are slowly unlocked. Instead, you slowly increase the range of your ship through upgrades, and unlock new areas by solving puzzles. Without spoilers, you are one of the last people alive, and you must traverse worlds looking for items to fix your teleporter. The story basically begins in media res, but is slowly revealed after each planet you visit. While Saira doesn't really bring anything new to table narratively (and despite only being four planets in, I'm pretty sure I already know the twist), it's still captivating enough to compliment the gameplay. And the gameplay is excellent. Platforming is very smooth and quick; Saira can run up walls, grab ledges, wall jump up corridors and use her momentum to clear large gaps. There's not a lot of challenge to the platforming up to what I played, but it's still very fun and well done. In addition, there are puzzles across the world. Usually this entails finding a code or symbol somewhere in the background or foreground in another section of the world. Interestingly, Saira is a photographer by trade; this becomes a neat gameplay mechanic where you can take tiny screenshots of the world to refer back to in later puzzles. There are lots of other fun twists too; for example, your ship is equipped with a radio chock full of indie stations and a very fun pinball machine, and Saira changes her clothes to suit the atmosphere of the world. Minor details, but the minor details come together to make a very engaging, if slightly easy, platformer. Do you like Lemmings? 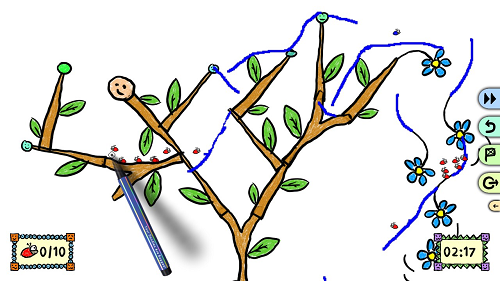 Wish you could doodle on your screen while playing Lemmings? Fresh from the wretched hive of scum and massage apps of Xbox Live Indie Games, Your Doodles Are Bugged is a fun little indie game. Like many indie devs, Spyn Doctor is working with the basic design doc of take an established game, mash it up with something else, and then tweak the formula a lot. In this case, it's the perennial mass suicide simulator Lemmings that gets reworked with draw your own level elements. It's been done before, but Spyn Doctor has the best presentation and level elements that I've ever seen in the admittedly small subgenre. You have doodles, and they are unfortunately bugged. To get rid of the cute little fellows, you need to vandalize your masterpieces with ramps, platforms, steps and what have you to get them into a pot of honey, where they live out the rest of their days happily gorging on sweet nectar. The levels are generally very freeform and haphazard, so there are lots of different ways to lead your doodlebugs to the end; it just depends on how creative/steady with the hand you are. The doodlebugs are also very jumpy; they're pretty good about hopping up steps and leaping small gaps, but they require a careful guiding pen to avoid getting stuck in the scenery (which will happen, and it will be the last doodlebug you need, and you will hate it for doing so). There are quite a few bonus remixes of levels, some free included DLC (with even more included in the Gala package) and, of course, a level editor. As you beat the campaign mode, you unlock more elements to be used in your works of brilliant art, and they can be shared around between friends. A nice little package, a good take on the Lemmings formula, and absolutely magical if you have the good fortune to play on a tablet computer. Why is this not on iOS yet? From the terrible at names studio Sigma Team (Alien Shooter, Alien Shooter 2, Alien Shooter: Revisited, Alien Hallway) comes the latest in generic naming, Zombie Shooter 2. But despite their naming woes Sigma Team is great at doing what they do best, and what they do best is top down shooters with an absurd amount of enemies. Zombie Shooter 2 has definitely come a long way from the bare bones release of Alien Shooter. You begin by creating a character, complete with customizable stats and a large body of collectable weapons. Then you shoot as many zombies as possible, levelling up as you do so. Basically every zombie trope is at play here; you've got a variety of kinds of infections (infected dogs and jumpy hunter enemies, for instance), splody barrels (that splode real nice), abandoned factories, keycard "puzzles" and tons of blood. If you're not a big zombie fan there's nothing that will jump out and infect (ugh) you with a lust for more zombie games. But if you're in the mood for mindless zombie shooter sequels, Zombie Shooter 2 hits all the beats nicely. As mentioned before, there are tons of dozens of enemies on the screen at once, but they can all be taken down very easily; it's numbers, not deadliness that gets you in the end. There are plenty of secret stashes to find, which gives you money to buy bigger and better guns and ammo. 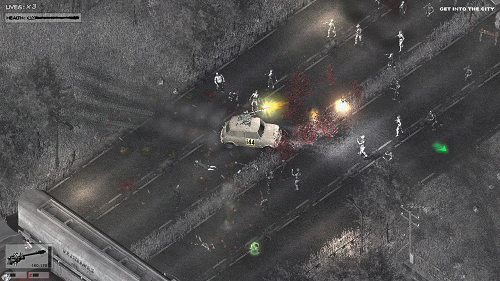 There are some nice new additions to the Zombie Shooter 1 engine, like car missions that involve a sweet machine gun and even more enemies than usual. And there are some neat survival bonus modes if you finish the campaign. No multiplayer to speak of, which is a shame because it would have been nice to see, but overall Zombie Shooter 2 is exactly what it says on the tin: a great zombie shooter. But wait? Are you worried that without playing Zombie Shooter 1 first, you'll miss out on the subtle intricacies of your player character's development as a hero? Well first of all, don't hold your breath for plot continuity. Second, if you beat the average price of the IndieGala, you'll get earlier entries in the Zombie Shooter and Hacker Evolution series. There's not a lot of significant changes between the two, so I won't bore you with details. 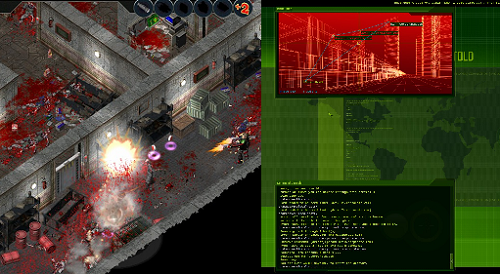 Zombie Shooter is more of the same, albeit a little simpler in terms of customization and engine, but still very splody. Hacker Evolution: Untold is similar but with typing instead of clicking making the game a lot more "realistic" and a lot harder for slow typists. In addition, you get the inMomentum OST, extra doodles for Your Doodles Are Bugged! and also the Zombie Shooter theme song. Interested? Because all of this can be yours, and you're donating to charity to boot. Not a bad reason to increase your backlog at all, and maybe it will hold you over till the next indie bundle comes along. Which, to be fair, there's probably one releasing as I post this. Pace yourselves, bundles!